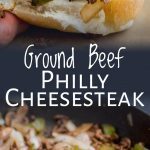 When Ground Beef Philly Cheesesteaks are on the menu, my kids go nuts!!! They can’t get enough of the delicious flavor-packed meat and melty cheese all together in easy to eat sandwich form – I use hoagie rolls or fun slider rolls. The ground beef makes it budget friendly and the bell pepper, onions and mushrooms mean my kids are getting veg, even when enjoying a sandwich! 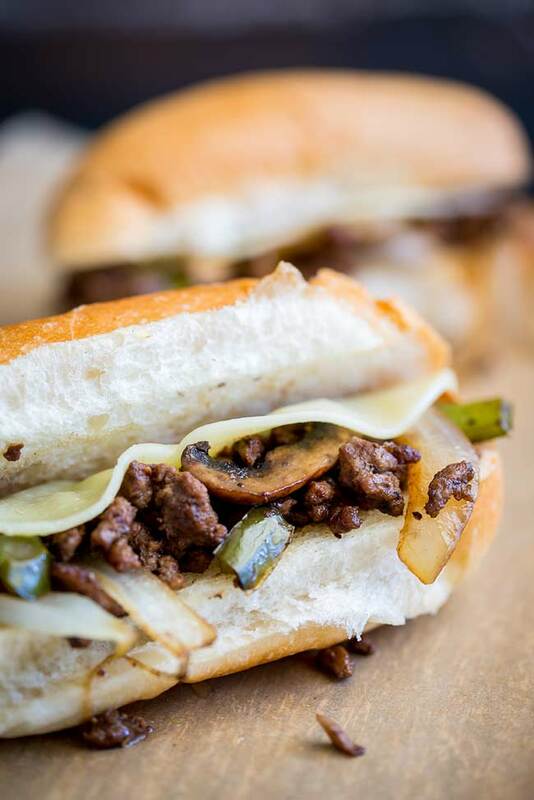 Plus Philly cheesesteaks are great for parties or game day! 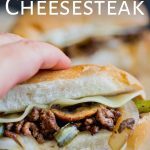 Who doesn’t love Philly cheesesteaks! 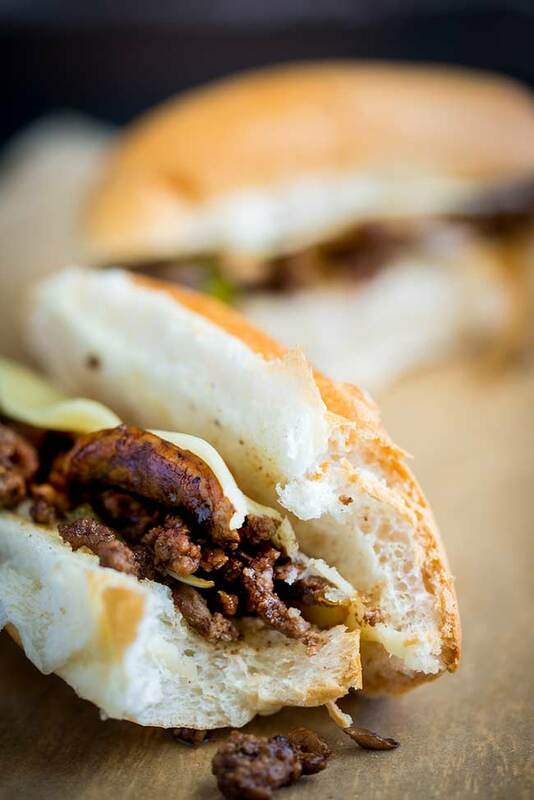 The thin strips of beef, the sweet onions, the slight crunch of the bell peppers and the juicy slices of mushroom. All cooked together and oh so delicious when topped with plenty of cheese. But slices that ribeye super thin is a pain in the backside! Who has time for that when the kids are hungry and dinner needs to be on the table in 30 minutes? That is why I came up with ground beef Philly Cheesesteaks. No slices beef plus ground beef is so much cheaper than a nice piece of ribeye! If I am buying ribeye then I am searing it in a skillet and searing it with my favorite balsamic butter! Did I mention that my kids go crazy for these?? I don’t know if it is sandwiches for dinner? Or the flavorful meat? Or the melted cheese. But they rush to the dinner table when this is on rotation. 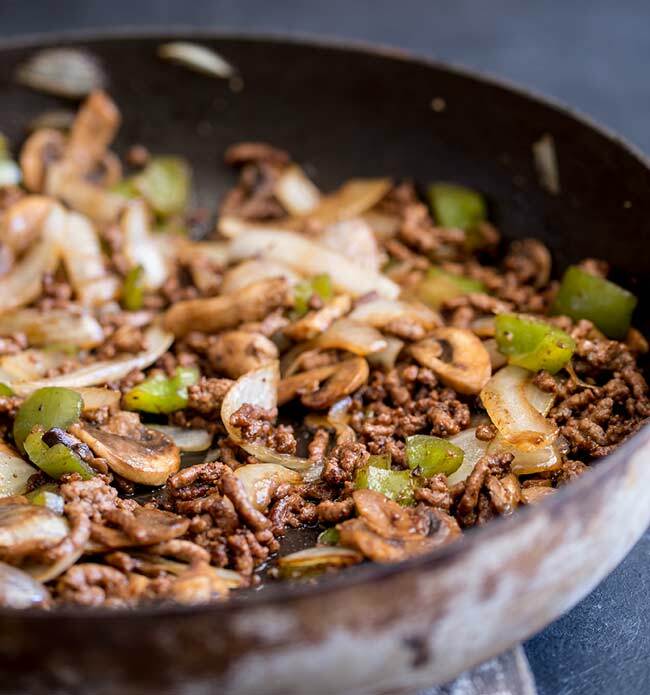 The key to getting plenty of flavor and also texture is to really let the ground beef crisp up in the skillet. To do this make sure the skillet is over a medium-high heat, add the oil and allow it to get to the shimmering stage then add the ground beef. Once the ground beef is in the pan use a spatula to slightly break the beef apart then let it cook untouched for several minutes. This creates a crispy crust on the beef, and that crispy crust gives it lots of flavor! Once the crispy bits start to form, you can break the ground beef up further and continue to cook. 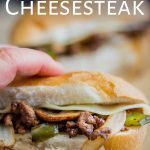 Which rolls to use for your Philly Cheesesteak? 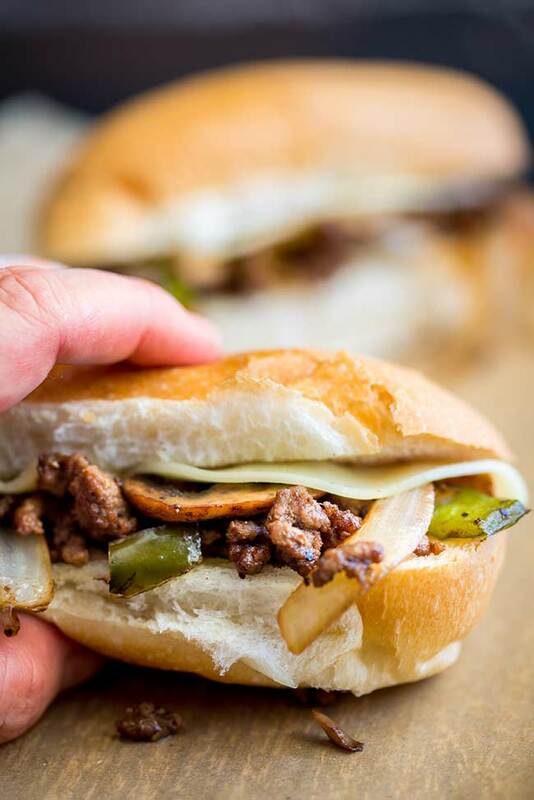 Traditionally cheesesteak rolls are long, soft, and slightly salted, and come from a company called Amoroso. Not everyone had that option so they have evolved into using any soft hoagie roll. But you can use any roll you like really. I buy mini hotdog rolls for my kids. They are the perfect size for them and they are always beautiful and soft. For a party try serving this ground beef mixture inside a slider bun! Or pick up a crusty roll and adds some crunch to your sandwich. There is much debate here! Some say it has to be American Cheese, some swear by a jar of Cheese whizz and some go with provolone. Being Australian, finding American Cheese is hard, and I searched everywhere for Cheese Whizz but came up empty. So provolone is our family choice. But go with your family preference here. Whilst just a sandwich is great for lunch, if I am serving this for dinner I like to add a couple of sides to complete the meal and get a few more fruit and veggies into the kids. How to eat ground beef sandwiches. I am a bit of a messy eater so ground beef inside a sandwich is hard sometimes. I have found the two tricks! 1) Thicken the beef mixture with some beef broth and cornstarch. It keeps the meat nice and juicy and stops it falling out of the sandwich as soon as you move it. 2) Cheese baby!! You want enough cheese to stick the ground beef to the roll. Add cheese to the top and bottom of your roll for maximum “glue”. (I didn’t do that for the photos as then all you could see was cheese! Which normally isn’t a bad thing 😉 But I wanted you to see the delicious beef too! 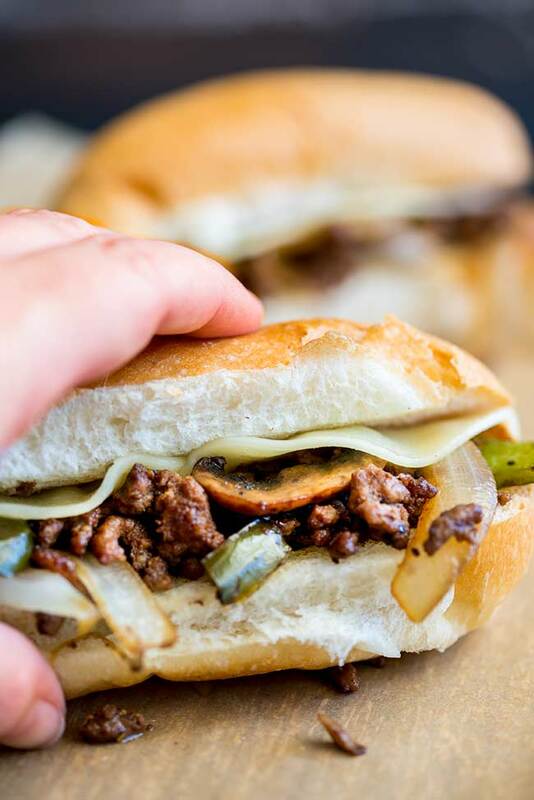 Pin this recipe for Ground Beef Philly Cheesesteak Sandwiches. Pin it here. 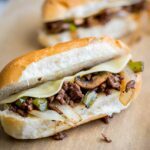 When Ground Beef Philly Cheesesteaks Sandwiches are on the menu, my kids go nuts!!! They can’t get enough of the delicious flavor-packed meat and melty cheese all together in easy to eat sandwich form – I use hoagie rolls or fun slider rolls. The ground beef makes it budget friendly and the bell pepper, onions and mushrooms mean my kids are getting veg, even when enjoying a sandwich! 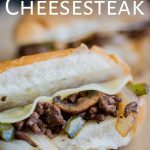 Plus Philly cheesesteaks are great for parties or game day! Start by preparing the veg. The onion needs to be peeled and sliced, the bell pepper needs to be cut into small dice and the mushrooms need to be sliced. Set these aside. Place a large heavy skillet over medium-high heat and add the oil. Break it apart slightly and then let it cook untouched for 2-3 minutes until a nice crust forms on the meat. Stir it about and break it up and cook for a further 3 minutes until it is deep brown in places. Use a slotted spoon to remove the beef from the skillet and leave the fat behind. Add the prepared veg to the skillet and cook for 3 minutes until everything has softened. Add the ketchup, Worcestershire sauce, salt, and black pepper to the pan and turn down the heat. Use a small measuring cup to mix the cold beef broth with the cornstarch, then add this slurry to the skillet. Cook for 3-4 minutes until everything is thick and coated. Add to the rolls and then top with the provolone cheese. 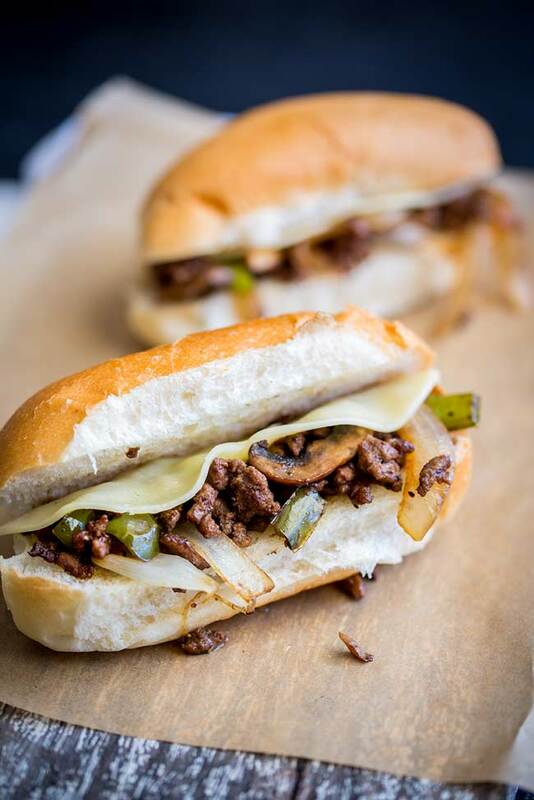 If you love food why not subscribe to my newsletter, I will drop you an email every now and then, just to say hi and send you a couple of recipes I think you might love, like these Ground Beef Philly Cheesesteak Sandwiches. These are delicious!! No reason to ever go out when I can make your recipe at home!! I’m always looking for more ground beef recipes and this one is a winner! Oh I am glad Milisa, It is such a great recipe for the kids too isn’t it?